Overview - Po the Panda is the laziest animals in all of the Valley of Peace, but unwittingly becomes the chosen one when enemies threaten their way of life. Over the course of the last year, I’ve become intimately acquainted with a uninspired collection of barnyard animals, a young adventurer who subtly perpetuates offensive stereotypes, and an unbelievably irritating sponge (with square pants, mind you) who apparently has no intention of teaching children anything of value. As my son has introduced me to the latest wave of preschool entertainment, I’ve come to one conclusion: four-year olds have terrible taste. Thankfully, animation studios continue to deliver well-written, beautifully rendered family flicks like ‘Kung Fu Panda’ that appeal to kids and adults alike. ’Kung Fu Panda’ tells the tale of Po (voiced by Jack Black), an overweight panda learning the ropes of his family’s noodle business from his father, a goose named Mr. Ping (James Hong). Even though Po doesn’t realize he’s adopted, he holds onto hope that his path will lead him to greater things than tending to his father’s customers. 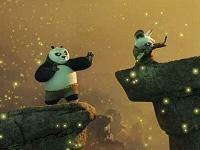 Rushing to see several iconic kung fu fighters, the clumsy panda inadvertently causes a wise sage named Master Oogway (Randall Duk Kim) to identify Po as the legendary Dragon Warrior. Unfortunately for Po, Oogway’s right hand, Master Shifu (Dustin Hoffman), has trouble accepting such a bizarre declaration. Tasked with training the tubby bear, Shifu hopes that his more talented students -- Tigress (Angelina Jolie), Monkey (Jackie Chan), Viper (Lucy Liu), Mantis (Seth Rogen), and Crane (David Cross) -- will intimidate Po and force him to quit. 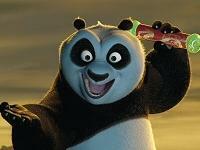 However, when a bitter criminal named Tai Lung (a scene-chewing Ian McShane) escapes from a fortified prison and plots his revenge on Shifu, it’s up to the chubby panda to save the day. Going into ‘Kung Fu Panda,’ I had three pressing questions on my mind: will it appeal to my son, will it entertain me, and will its animated kung fu sequences amount to little more than window dressing or will they genuinely enhance the film? I was pleased to find a positive answer to all three. My son was an uncontrollable ball of joy, hopping around his seat as if all the sugar in the world had settled into his blood stream for ninety-two minutes. I can’t blame him. Whether I found myself chuckling at the film’s clever gags, oohing and ahing at its animation, laughing at its best jokes, or purely enjoying a fun flick with my kid, I was completely smitten with the story, characters, and animation. Best of all, as the resident kung fu geek in my circle of friends, I was quite impressed with the battle sequences. 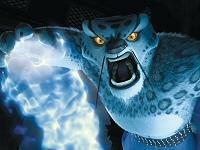 Tai Lung’s escape is brutal and hard hitting, the bridge fight (the film’s key action sequence) is fantastic, and Po’s showdown with Tai Lung balances the film’s humor, the character’s appeal, and the severity of the outcome. The voice acting is exceptional as well. Love him or hate him, Jack Black keeps things sweet and innocent with Po, anchoring the film with his believably naïve performance. McShane matches Black’s vocal virtue with gravely snarls and menacing taunts, all effectively conveying his character’s malice and hatred. Lest we forget the rest, Hoffman, Jolie, and Chan (as well as other minor supporting cast members like Hong and Duk Kim) also sell their respective roles, effectively emoting while injecting the film with intensity, conviction, and wit. Granted, Liu’s performance is bland, Rogen and Cross are completely underused, and Michael Clarke Duncan (voicing a guard at Tai Lung’s prison) doesn’t have the best delivery, but they only pop up for a few minutes throughout the film and rarely detract from the work offered by the rest of the cast. Even so, the quality that won me over in the end was simple: ‘Kung Fu Panda’ doesn’t rely on countless pop culture references like the majority of Dreamworks Animation productions have in the past. The film could have easily devolved into a series of obvious references, Hollywood tabloid jabs, nods to other movies, and a variety of other blatant distractions, but instead, the film continually takes the Pixar high road to concentrate on simple but meaningful dialogue, reliable but refreshing character interactions, and playful but engaging artistry. Ultimately, ‘Kung Fu Panda’ is, in my humble opinion, the best animated film Dreamworks has produced, and the first Dreamworks feature that can legitimately go toe-to-toe with the films in Pixar’s canon. Whether you have children or whether you’re just a taller-than-average kid yourself, this one won’t disappoint. The Blu-ray edition of ‘Kung Fu Panda’ boasts an unequivocally gorgeous 1080p/AVC-encoded transfer that is, simply put, as perfect as they come. Vibrant colors leap off the screen, deep blacks inject depth and dimension into the picture, and bright contrast keeps it all looking just as clean and clear as it must look on the animation staff’s computers. Detail is breathtaking as well. From the stitching on Po’s pants to the fur on his flipping companions, from backdrops cloaked in shadow to the flickering flames spilling from Tai Lung’s paws, this is one of the finest CG productions I’ve had the pleasure of reviewing. To top it all off, the image isn’t disrupted by any significant artifacting, banding, noise, or post-production meddling of any kind. It’s quite simply a flawless picture that effortlessly renders its animators’ every intention. Reference level? Oh yes. An unbelievable upgrade from the standard DVD? Without a doubt. One of the best transfers on the market? Absolutely. 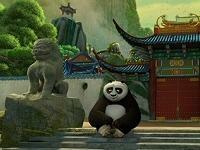 ‘Kung Fu Panda’ joins ‘Ratatouille’ and ‘Cars’ as one of the most stunning animated presentations available on home video. I apologize for using so many glowing superlatives, but I can’t praise this transfer enough. ’Kung Fu Panda’ rounds out its powerful presentation with a jaw-dropping Dolby TrueHD 5.1 surround track that easily matches its striking video transfer blow for blow. Dialogue is crisp, well balanced, and perfectly prioritized, the LFE channel is aggressive and booming, and the rear speakers are continually populated with intricate environmental ambience and convincing interior acoustics. More importantly, the track is dynamic and weighty. Low-end thooms are earthy and resonant, adding genuine heft to the various punches and kicks, and treble tones are clear and stable. Best of all, the soundfield itself is instantly inviting and full immersion is a cinch. ‘Kung Fu Panda’ may be an animated film, but it rivals the best lossless tracks on the market when it comes to its increasingly credible soundscape and faultless sonic delivery. If the film’s video transfer alone isn’t enough to rocket you to Amazon or Best Buy, ‘Kung Fu Panda’s TrueHD wonder will hopefully seal the deal. It’s an involving, reference quality mix that shouldn’t be missed. 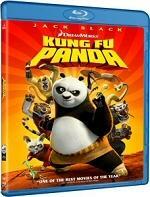 The Blu-ray edition of ‘Kung Fu Panda’ packs in almost all of the supplemental content that appears on the “Secrets of the Furious Five” 2-disc DVD, presents all of the video content in high definition, and even sports a trio of generous exclusives (discussed at length in the next section). The only thing that seems to be missing is the twenty-four minute animated short film included on the DVD’s bonus disc that features Po’s fighting friends. Hopefully, these shorts will turn up as a BD-Live download. Audio Commentary -- Directors John Stevenson and Mark Osborne deliver a relaxed but informative track that covers the genesis of the project, the various decisions made throughout pre-production, the scripting process, the voice casting and recording sessions, the animation and characters, and a variety of other topics. While there aren’t many things on the commentary that will surprise fans of the film, it’s still a pleasant and interesting track that adds quite a bit of value to the supplemental package. Inside Kung Fu Panda Featurettes (HD, 23 minutes) -- “Meet the Cast” is a fairly lengthy series of interviews with the voice talent, “Pushing the Boundaries” briefly explores the animation and character design, and “Conversation International: Help Save Wild Pandas” is a PSA with Jack Black. Sounds and Moves Featurettes (HD, 35 minutes) -- “Do You Kung Fu?” is a hefty twenty-four minute introduction to kung fu for kids, “Sound Design” explores the film’s audio, “Kung Fu Fighting Music Video” features the title song as performed by Cee-Lo, and “Learn the Panda Dance” is a self-explanatory how-to short. Land of the Panda Featurettes (HD, 26 minutes) -- “How to Use Chopsticks” is an instructional short for children, “Inside the Chinese Zodiac” looks at the Chinese calendar and its representative symbols, “Animals of Kung Fu Panda” focuses on the animals that inspired ‘Kung Fu Panda’s characters, “Mr. Ping’s Noodle House” focuses on a chef making noodles, and “What Fighting Style are You?” is an interactive quiz. Po’s Power Play Activities (HD) -- “Learn to Draw” introduces the ‘Kung Fu Panda’ artists as they showcase the various characters in the film, “Dumpling Shuffle” is an interactive game involving three bowls and a shifty dumpling, and “Dragon Warrior Training Academy” is a second game that lets players attempt to achieve fabled hero status. Dreamworks Animation Video Jukebox (HD) -- A now standardized feature that pops up on nearly every Dreamworks Animation release, this jukebox contains short music videos from other notable DA films. ’Kung Fu Panda’ will not only appeal to both kids and adults, it will win over martial art fans, animation junkies, and anyone who just enjoys a fun family flick with no strings attached. The film’s Blu-ray release is even better. 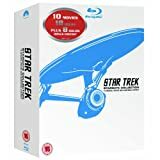 With a reference quality video transfer and TrueHD audio track, a generous helping of supplements, and some compelling exclusives (online and off), this disc should be on everyone’s shelf. Whether you’re showing off your home theater, spending a night with the fam, or just looking for an avalanche of quality animation, ‘Kung Fu Panda’ is perfect for the occasion.